Huge Thanks From Paul Weller News! – Paul Weller News! Huge Thanks From Paul Weller News! 6 Comments on Huge Thanks From Paul Weller News! Just wanted to send out a huge thanks to anyone and everyone that contributed pictures, set lists, videos, etc. as we chronicled the latest tour from Mr. Weller. It’s most certainly appreciated by fans throughout the world to be able to get a glimpse of what those in the UK have been so thoroughly enjoying. We saw the debut of new songs from the upcoming album as well as tunes that have not been played in over 25-30 years. We will be here to keep you up to date as things pick up for a big 2010 for Paul and we certainly hope you’ll keep this a spot in your travels and continue those wonderful contributions. All the very best to you!! Thank you for your time and efforts. As a huge Weller fan this is a site I visit everyday and truly appreciate your work.Thank you again and I look forward to a epic 2010 for Paul. Cheers for all the efforts boys!! Top resource and one place you can guarentee to hear what is happening in the world of Mr.Weller. Always the first place i visit and well worth it every time.Looking forward to 2010.
number 1 for weller info! 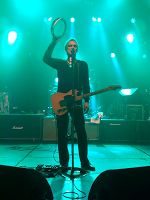 Previous Entry Paul Weller – Cambridge Corn Exchange, 12th December – Pics & Set List! Next Entry Paul Weller After Gig In Cambridge!